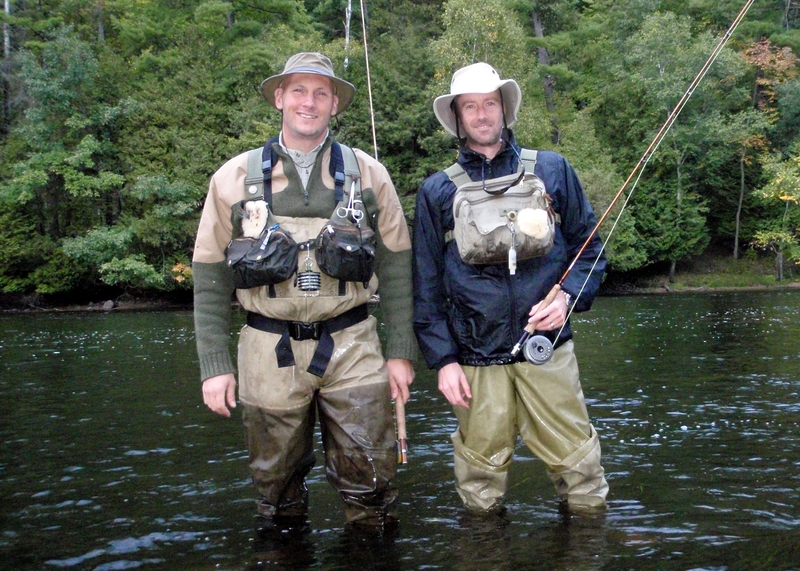 Jon Osborn and Joe VanFaasen, authors of Classic Michigan Flies stop while fishing the Muskegon River. Courtesy photo. In the spring, when thoughts of trout fishing inevitably hit hard, I almost always bring the fly boxes out for a gander. One by one, I pick through them looking for gaps, the flies I need to replace for the coming season, having left some hooked on a stream snag, an overhanging branch or a fish that broke off. Invariably, I will count how many Adams flies I have. To be frank, it’s rare that I use them, but I take comfort in their presence and never hesitate to tie one on when all else fails. They were the first flies I used when I started fly fishing, and they remain a classic Michigan fly design today. 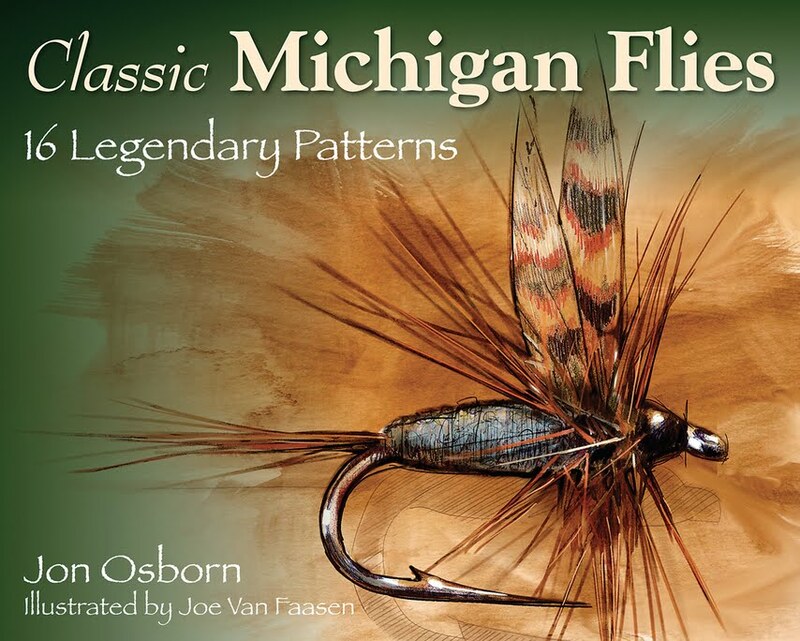 “If ever there was a do-all, go-anywhere fly pattern, the Adams is it,” Osborn writes about the circa 1922 fly pattern designed by Michigan fly angler, Leonard Halladay for his friend, Charles Adams, a Ohio judge and the fly’s namesake. The Adams pattern today is as much a part of Michigan trout fishing history as the legendary but now extinct grayling that used to swim in state waters. Its characteristic striped wings and gray body have tantalized Michigan trout for nearly 90 years. 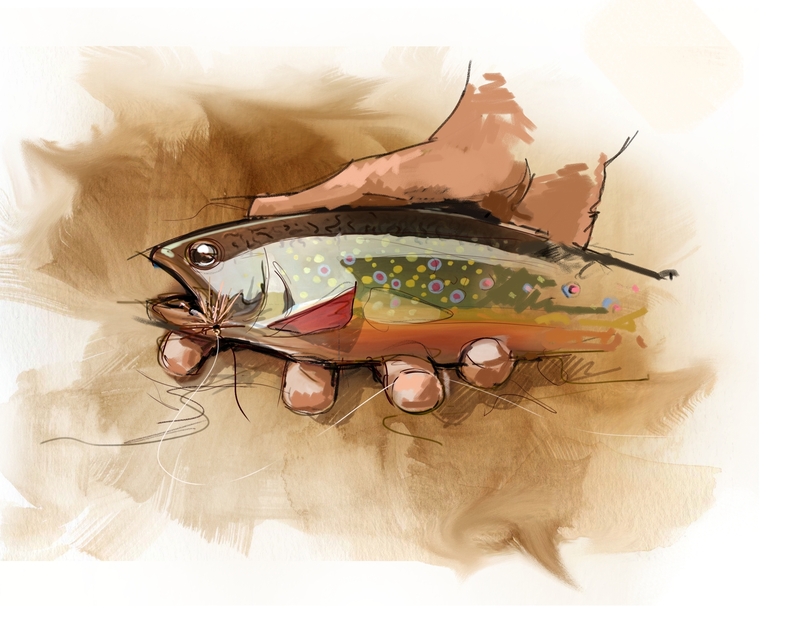 “We had three groups of people in mind when we did the book: people who love fly fishing, people who love history and people with an appreciation for art,” said Van Faasen, the book’s illustrator. His watercolors grace most of the book’s pages. Osborn and Van Faasen are natives of Holland. Osborn is a police officer there. Van Faasen is a product designer and artist. 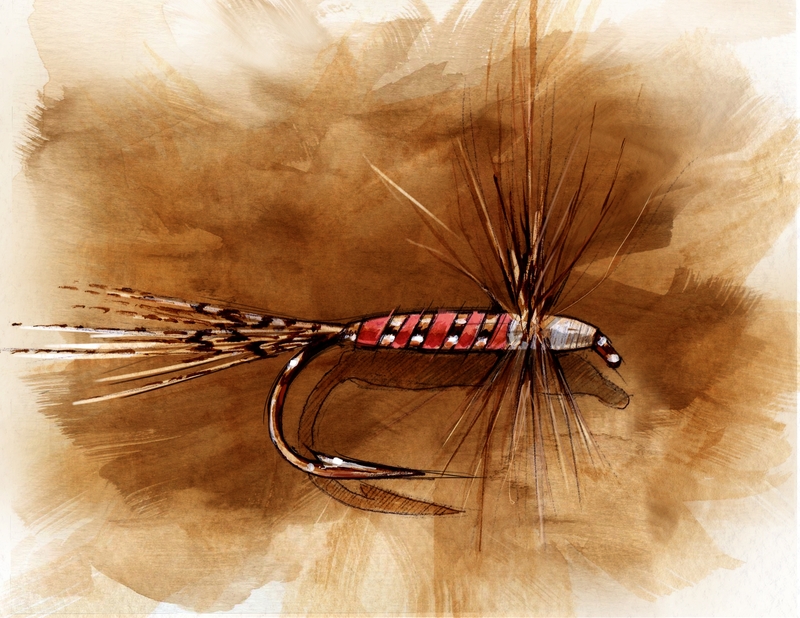 Both love fly fishing and the lore that surrounds it. They bring a slice of it to life with their book. Bob Fortney’s attractor fly. Illustration by Joe Van Faasen. drawing on a variety of historical and contemporary sources with a touch of literary license for flourish and mood. The result is an eminently readable book that presents the origins of each fly and recipes for tying the original style and modern versions. Flip through its pages, and you embark on a journey into Michigan fishing history. There is Bob Fortney’s original 1932 dry-fly, once a comer on Michigan streams. It’s pink-and-gold-ribbed body resembles nothing that anyone knows of, but dressed up with a wood-duck flank tail and grizzly hackle, it passed for a May fly and was fished as an attractor, much like an Adams. Fortney lived in Paris and worked as the district fisheries supervisor for the Michigan Department of Conservation. Griffith’s Gnat is another historic treasure, said to be created in the 1940s by George Griffith, co-founder of Trout Unlimited. But was it? Osborn discusses the controversy that still reigns today over its origin. Osborn and Van Faasen came up with the idea for the book over beers. Each knew of the other, but fishing together would come later as a result of the project. Both wanted to create something to help anglers remember. “We wanted to focus on Michigan because we live here, and that was always one of the things we knew would stick,” Van Faasen said. “We wanted to capture the legend of Michigan fly fishing. When I finished reading “Classic Michigan Flies,” I have to admit I felt compelled to dig out my fly boxes, though spring still is a few weeks away. I had no Cabin Coachmen or Madsen’s Skunks, certainly no pink-and-gold Fortneys. But there, in the upper left hand corner, was a row of Adams — four of them to be exact. I looked at those classic flies with new appreciation — felt a familiar longing for spring — and vowed to fish them once again. This story appears on: MLive Outdoors. This entry was posted in Uncategorized and tagged Adams, Artificial Fly, AuSable River, AuSable River Lodge, Circus Peanut, Classic Michigan Flies, Fishing, Fly Fishing, Fortney, George Griffith, Halladay, Joe VanFaasen, Jon Osborn, Kelly Galloup, Russ Maddin, Rusty Gates, Trout, Zoo Cougar. Bookmark the permalink. 6 Responses to Holland Anglers Bring ‘Classic’ Michigan Flies to Life. I feel a need to go book shopping. A short but fantastic read!!!! I have been through it twice. And, I was taken back to boyhood streams with a couple of the stories… I loved it and recommend it heartily, especially to all of my fellow Michiganders.